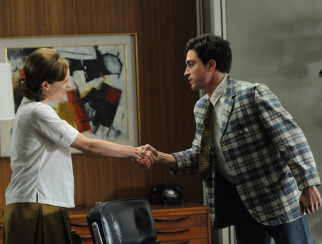 Tenure, The “Not Invented Here Syndrome” And Mad Men, Season 5, Episode 3. I am catching up on my Mad Men viewing after a spring break trip abroad. I watched three episodes in one sitting last night. In Episode 3, copywriter Peggy interviews candidates for an open position. She likes the work of Michael Ginsburg whose portfolio is labelled “judge not, lest you be judged”. Her co-worker agrees with Peggy’s assessment of Ginsburg’s work but advises her not to hire him because, if Ginsburg turns out to be a better copywrite than Peggy, she risks losing her job to him. Later in the episode (or was in the next? ), Pete humiliates Roger, taking credit for winning an account for the advertising company. Roger storms out. He says he was good to Pete when he was young, recruited him and look how he is lording it over Roger now. A portend of Peggy’s future? Recruiting and peer review are plagued with incentive problems in the presence of career concerns. If you recruit somebody good, you risk the chance that they replace you later on. You have an incentive to select bad candidates. You have an incentive to denigrate other people’s good work (the NIH syndrome) for even deliberately promote their bad work in the hope that it fails dramatically and this allows you to leap over them in some career race. The solution in academia is tenure. If you have a job for life, you can feel free to hire great candidates. (Various psychological phenomena such as insecurity compromise this solution of course!) Peggy does not have tenure and even Roger who is a partner faces the ignominy of playing second fiddle to a young upstart. Watch out Peggy! 1. If “the solution in academia is tenure”, why can’t it be at Sterling Cooper Draper Pryce or other workplaces? What makes them different? A hedge fund partner wants to hire the best portfolio managers. Why not giving the accomplished ones a job for life? If they really aren’t, could the elimination of a tenure system solve different types of incentive problems? Discuss. [Historical note: tenure was not devised to solve these incentive problems, nor to reward accomplished professors, but to protect freedom of speech. Never confuse a theory paper for reality]. 2. Pete Campbell is not that young an upstart any more, having worked with Sterling Cooper at least from 1960 (at the age of 24). The fifth season is set in 1966. This has been a common argument for job-tenure-based layoff systems since well before I took labor economics as an undergraduate in 1967. Yet such systems have been under attack for at least as long. A similar problem occurs in academic conference reviewing. I submit a paper to a conference at which I am also on the Programme Committee. I receive one or more papers to review. I treat them generously, and they end up being accepted. My own paper, on the other hand, is reviewed adversely, and is rejected. Would I have been better off being more negative on the papers I reviewed, so as to increase the chances for my own paper?